If I had homework in Kindergarten, I don’t remember it. I don’t remember bringing home copied packets of paper asking me to trace the letter P or color apples red. This is perhaps because I’m so old that photocopiers didn’t exist in schools and we, instead, were sometimes given much more labor-intensive mimeographs that reeked of the intoxicating aroma of blue ink. But now, thanks to the age of high-end photocopy machines, homework packets arrive at home on Monday. Eight pages of tracing, writing, drawing and coloring that must be completed and returned by the next Monday so the cycle can start all over again. TheMonk sits down and hammers out each page as if this is his sole purpose in life. You tell him how many pages he has to do and he won’t look up until it’s done. There is no debating. There is no bargaining. The boy has a job to do and he’s gonna do it. Swee’Pea, on the other hand, isn’t such a linear thinker. She might start on a project but the moment she has difficulty, she shuts down. She pleads. She whines. She announces over and over and over again just how much she does not want to do this homework. And over the last few weeks we’ve come to realize that it’s best not to argue with her about this. If she doesn’t want to do it, she won’t and there’s no use in getting into an argument with a five year old about how failing to draw a picture of a banana will send her to a life of poverty and crime. And 9 times out of 10, after she’s had a little break or even eaten dinner, she’ll suddenly announce that she wants to finish her homework. And she does so without complaint. I’m sure there’s a lesson in there somewhere. Something about letting kids find their own way or the most valuable lessons kids learn are the ones they teach themselves. I nod knowingly and look to TheMonk to reassure him that all will be ok. I see the fear in his eyes and I silently kick myself for telling him that the dentist was just going to make sure his teeth were okay. I shouldn’t have made empty promises and now I am paying the price and feeling like a loser. These words seem to relax him a bit and I tell him it’s okay to be scared but that everything will be fine. We are escorted to a room where he’s weighed and then given a liquid to drink. We sit on an exam table, waiting for the relaxer to take effect and I can tell TheMonk is still nervous. 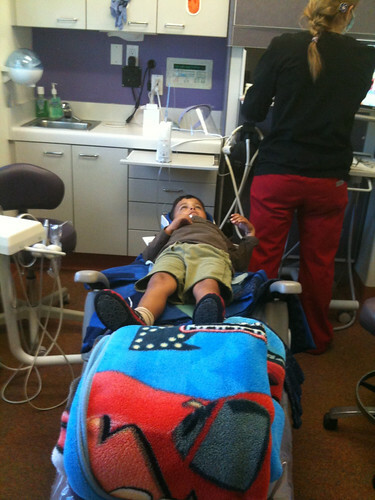 Every once in a while he turns to me and cries, “But Daddy, I don’t wanna get my tooth pulled! I want it to fall out on its own!” I squeeze him tight and reassure him as best I can. Before we know it we’re in the room where the tooth will be extracted and they get him settled in and he begins to breathe in the nitrous oxide gas while laying on the table watching an episode of Olivia on a TV in the ceiling. It is then that I’m informed that they will be removing both front teeth. I protest slightly but I’m told it has to happen as both teeth have shallow roots and won’t survive the trauma. I consent and continue to watch TheMonk who, at this point, is beyond any trepidation as pharmaceuticals take over and he begins giggling randomly on the table. I make a mental note to have the “Just say no to drugs” talk with TheMonk earlier rather than later. Before we know it both teeth are gone and I carry a sleepy Monk to the car. 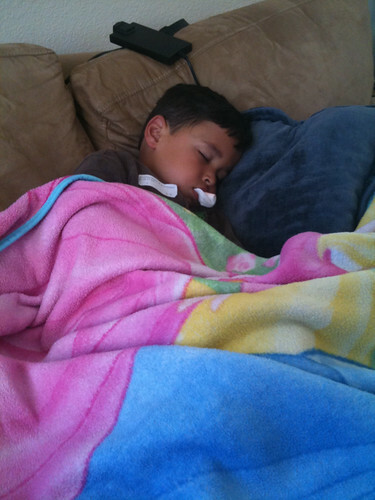 We get home, change the gauze, and he crashes on the couch while watching cartoons. He is an angel and I sit close by and take a deep breath as I realize just how stressed I have been for the past couple of hours. When TheMonk awakes after an hour and a half nap he begins to cry as I take the gauze out. His mouth feels funny but Mommy soon arrives with ice cream to make it all better. Vanilla ice cream with chocolate syrup makes lots of things better. And after all the stress of the day, it is this moment that has me fighting back tears. Yes, Monkey. You sure can, you sweet, sweet boy. I’ve never been so proud as I am at this moment. Your mother shares it with me as I come home from work and you welcome me with excited tales of how you got to choose a prize for reading 20 stories. Our bedtime stories that I had meticulously chronicled each night for the past 10 days opened up treasures of pens with beads glued to it and a small box of crayons. I smile at you both and I am struck by the change in you. The change from four to five years took place only six weeks ago. The change from preschool to kindergarten took place only 12 days ago. And yet, the change in you cannot be measured. You have both tackled a new chapter in your life better than I could have imagined or, perhaps, feared. You are both enjoying your own teacher, being apart for the better part of a day, and have thrived not only in school but socially as well. You have flourished where I feared utter failure. I shall try not to underestimate you again. You both have adjusted to taking the bus to school. It took TheMonk five seconds to adjust while it took Swee’Pea five days. But you adjusted. And now, as I see you onto the bus (Kindergartners board first!) each morning and we wait for the other children to board the bus, we make eye contact and play a game of seeing as who can make the silliest faces. I always win. But you’re getting better. And each day your mother greets you at the bus stop and shares your brilliant smiles as you come home from your latest adventure. And as you share your day with Mommy while eating an afternoon snack and drinking pink milk, your mother texts me any important news. And as I race home to celebrate Star Students or to help take Millie the Monkey on a bike ride, I am reminded that this only happens once. Only once will you be so excited to show me that you can write the number two. Only once will I hear stories of who brought home the coveted blue cards (while also hearing who in class brought home the dreaded red card). Only once will I get to call my two little ones Kindergartners. And at the end of the day, as we read our two bedtime stories while fighting a case of the grouchies because of your afternoon nap has been yanked away so suddenly, I savor the moment. For I know that before long you will be reading your own stories and my role will be as listener and not reader. And while that moment might come five months from now. It’s gonna seem like five seconds.